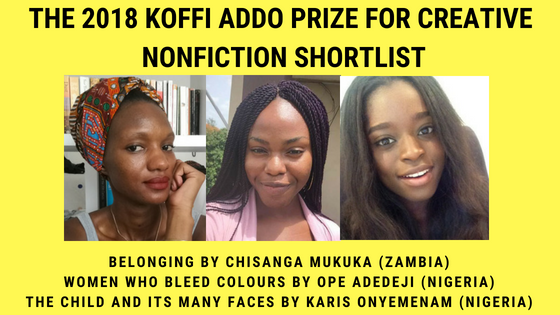 The Koffi Addo Prize for Creative Nonfiction 2018 Shortlist was announced on July 21, 2018. Those in the running for the prize are Chisanga Mukuka (Zambia), Ope Adedeji (Nigeria), and Karis Onyemenam (Nigeria). The Koffi Addo Writivism Prize for Creative Non Fiction Prize is named after Nana Koffi Addo a Ghanaian who was born on 6th May 1921 in Abetifi, Kwahu and passed on, the 2nd of December 2011. Addo had numerous articles published in various magazines and left behind 3 unpublished manuscripts including “Guidance for Young Women”. The prize, administrated by the Writivism Literary Initiative, first ran in 2016 and was only open to Ghanaian writers. It would be won by Accra based yoga instructor S.Y Tetteh for her piece Lost Futures Or: A Guide to Losing Love. The second edition of the prize was open to writers from the whole continent and would be won by South African writer Charles King for his story Meat Bomb. Ope Adedeji dreams about a lot of things but most especially about bridging the gender equality gap and destroying the patriarchy. She is an intellectual property lawyer and currently, the Managing Editor of Ouida Books. Her work has appeared on Arts and Africa, Afreada and the Kalahari Review. If you do not find her reading a book, you would find her writing one. Karis Onyemenam is a poet, writer and freelance photographer. Her short story was recently published in the inaugural issue of FLY zine, an online magazine that curates the experiences of women and non-binary people of colour at the University of Cambridge. Her Koffi Addo submission is part of a broader project that explores conflicting identities and the immigrant experience. The three will attend the Writivism Festival in mid-August where the winner will be announced. The winner will go home with US$500 and those shortlisted get US$100. Previous Previous post: Writivism Short Story Prize 2018 shortlist announced. Next Next post: Exclusive: Yvonne Adhiambo Owuor’s “The Dragonfly Sea” for March 2019.